it can serve as a macroprudential regulation. 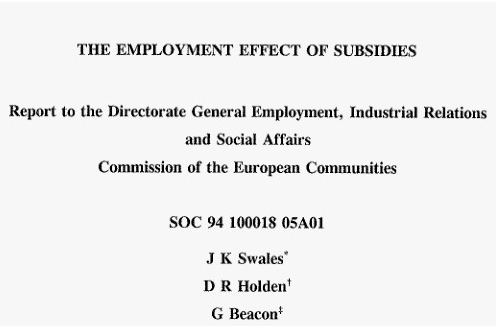 The proposal in our report to the European Commission (in 1995) is to “subsidise” jobs through a flat rate rebate on Value Added Tax. The proposal is revenue neutral. The rebate is balanced by an increase in the nominal rate of VAT and estimated savings on benefits as employment increases. This proposal increases employment at the lower-paid end of the labour market because a flat rate tax rebate has a greater proportional effect for low paid jobs. A point often misunderstood is that this proposal actually raises the take-home pay of the low-paid by increasing the demand for their labour. A grant from the European Commission enabled Professor J.K.Swales and Darryl Holden of the University of Strathclyde to model the effects and sharpen up the economics of my previous publications. The term “subsidise” was perhaps unfortunate. The “subsidy” in the scheme is a tax rebate paid to employers. It is a reduction in their tax bill and therefore not government expenditure. This point has been accepted by the UK Treasury. However, in contexts such as this, there is little difference in the economics between a subsidy and a tax rebate: a subsidy cheque from the Government has much the same impact as a equal cut in a tax bill. The political perception should be the same – but, of course, it isn’t. “Macroprudential regulation” is a concern of the Bank of England. The goal of macroprudential regulation is to reduce the risk and the macroeconomic costs of financial instability. Unemployment is a “macroeconomic cost” of financial instability and is part of the recent +“stress tests” on UK Banks carried out by the Bank of England. Our proposal made to the European Commission in 1995 is a macroprudential regulation because it has the capability of controlling the level of unemployment. This will be important in periods of financial instability. A copy of the report can be downloaded from EC Final Report 1995. … governments are generally concerned about the overall level of taxation within the economy. However, the type of integrated subsidy and tax scheme that we investigate in the simulations could, in principle, be operated as a uniform tax scheme. That is to say, the change in the firm’s tax bill could be calculated as the net difference between the additional VAT and the per capita subsidy. In so far as the scheme increased total employment, and thereby reduced payments of unemployment benefit, it would be associated with a reduction in the required overall tax take. That is to say, the introduction of the new tax scheme would increase employment and reduce taxation. P.S. An earlier paper Employment creation with very large scale labour subsidies was a precursor to this work. Prof Swales proposals can be expressed very easily. Firms that are labour intensive pay less VAT and the others pay more. [These proposals] do not rob the private sector of resources but reallocate resources within that sector. [They] generate an expansion, not contraction, of private sector economic activity. The private sector does it. If the labour subsidy could be incorporated as part of a tax scheme, in the form of tax rebates, the total tax take would actually fall. The proposals are a rebalancing of tax – reducing them on employment and increasing them elsewhere. Because unemployment creates government expenditure both total taxes and government expenditure are reduced. A tax forgone may have the same “fiscal effect” as government expenditure but it does not have the same “effect”. Spending your money is not the same as government spending your money for you. The “economic effect” is quite different. James’ Hansen has proposed a Carbon Fee which would tax carbon and return all the proceeds to citizens as monthly cheques. Hansen prefers to use the term “fee” because “taxes” are spent by governments and the proceeds from the Carbon Fee are not. This would support the lower-paid who have lower carbon footprints than the affluent. This could allow other changes to tax regimes which could counteract the poverty trap that unemployment payments can create, mirroring some of the effects of Professor Swales proposals to make Value Added Tax employment friendly. Professor Swales will soon finish his duties as Head of the Economics Department at The University of Strathclyde. Perhaps he will now have the time to investigate the employment effects of Hansen’s Carbon Fee. A Basic Income Grant (BIG) is a monthly cash grant (e.g. N$100) that would be paid by the state to every Namibian citizen regardless of age or income. The introduction of the BIG has led to an increase in economic activity. The rate of those engaged in income-generating activities (above the age of 15) increased from 44% to 55%. Thus the BIG enabled recipients to increase their work both for pay, profit or family gain as well as self-employment. The grant enabled recipients to increase their productive income earned, particularly through starting their own small business, including brick-making, baking of bread and dress-making. The BIG contributed to the creation of a local market by increasing households’ buying power. This finding contradicts critics’ claims that the BIG would lead to laziness and dependency. Rubin talked about why he believes high oil prices caused the recent recession. He also talked about how high oil prices are likely to vastly reduce globalization. He views this as a positive situation, because he expects this will change supply curves in such a way as to make American-made products more competitive. He believes that we will find our new smaller world much more livable and sustainable. Rubin believes the correct approach to rising oil prices is not to cut taxes on oil but even to increase them.